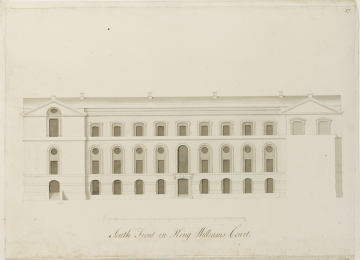 [12/30] Record drawing of completed design for the north elevation of the south range of King William's Court, including a blank section through the link block between the south range and the central block on the west side, and omitting the colonnade on the east side. You are here: CollectionsOnline / [12/30] Record drawing of completed design for the north elevation of the south range of King William's Court, including a blank section through the link block between the south range and the central block on the west side, and omitting the colonnade on the east side. Elevation, with blank section through link block on west side. In brown ink in unidentified hand beneath scale bar, South Front in King Williams Court; and with numbered scale bar; and in C19 hand at top right, 37. The drawing is in the same hand as [12/25, 26 and 31]. The central door is not shown in Campbell's perspective published in 1725, nor is it on the model of c.1699. However, it appears on Hawksmoor's plan of 1728 and may therefore be a later amendment to the design on which work began in 1699 (see Bold 2000, figs 156, 142 and 144).